Multi-partner demand generation can be complex, and many organizations fail to run successful programs consistently. Vendors who succeed have a clear strategy and a comprehensive understanding of integrated marketing techniques and campaigns that are closely aligned with partner types and partner competencies. They also have developed an understanding of the core components of an effective automation platform, and are committed to monitoring and learning from key performance metrics. This guidebook explains everything you need to know about planning and executing multi-partner demand generation programs and achieving positive return on investment. Download your COMPLIMENTARY COPY of the Multi-Partner Demand Generation best practices Guidebook and learn how you can Achieve Positive ROI. RequiredPlease enter correct emailPlease register with your company email address. Why do most multi-partner demand generation programs fail? Which tactics work best in particular situations? How can automation help, and what key factors should I consider when considering an investment in technology? 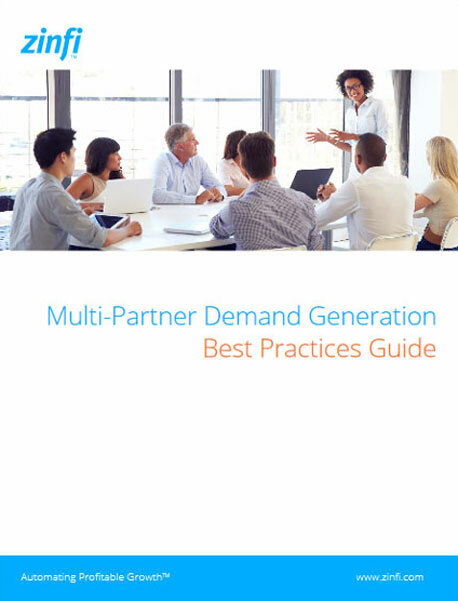 The Multi-Partner Demand Generation Best Practices Guidebook will answer these questions and countless others to help you refine your programs and make the most of your partner network. In addition to providing numerous partner marketing best practices and practical advice based on years of experience working with vendor organizations across the world, this guidebook explains in detail the tactics and technology necessary to run multi-partner demand generation programs that are efficient and cost-effective, and generate the highest ROI. Generate more revenue. Use ZINFI PMM. Comprehensive: ZINFI’s Partner Marketing Management (PMM) comes with a comprehensive set of twelve individual modules, but you can pick and choose what you need. This allows you to start automating your partner marketing activities based on what is relevant for your buyers and partners. The comprehensive nature of ZINFI’s PMM platform leads to a reduction in deployment cost and speeds up time to revenue significantly. Easy-to-Use: Using ZINFI’s Partner Marketing Management (PMM) platform is incredibly intuitive and easy. Both vendors and partners can quickly upload lists and campaign assets to run fully integrated campaigns that are highly effective. This intuitive mode of usage not only drive higher adoption of marketing tactics and tools, but also repeat usage by vendor and partner users. Global: ZINFI’s Partner Marketing Management (PMM) platform is supported not only in multiple languages, but with localized resources in various countries around the world.